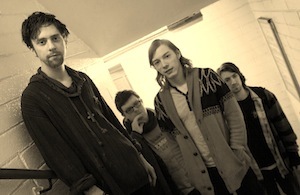 Rising from the ashes of a variety of defunct Cork bands comes, The Vincent(s). Despite the band being just a few months old, The Vincent(s) have already managed to serve up one hell of a debut single in ‘Asked Her to the Dance’, firmly securing themselves a place at the forefront of Cork’s music scene. This stressed out melancholy surf tune could’ve come straight out of the early 90’s alt scene. ‘Asked Her to the Dance’ kicks off with some heavy guitar and even heavier percussion – instantly pricking the ear and offering a quick nod to The White Stripes. It’s bleak and it’s bleary and just enough to draw you in. The slightly unpolished rawness of the track just adds to its strength. The stuttered movement of the track makes way for an instant chorus that buries its way into the mind; it’s cry “I’m ready to lose” will definitely become a chant-along moment for indie club kids and concertgoers. Front-man Marcus’ vocals come across as somewhat affected – as though he’s doing an impression or mimic rather than just performing. The channeling of a faux Americana comes across as a bit disingenuous when compared to say the effortlessness of Alex Hungtai, the musician behind the similar sounding, Dirty Beaches. But this is only a minor fault and something that can be perfected with time. What we have in The Vincent(s) is a lot of potential and we look forward to hearing plenty more from these Cork boys in the near future. ‘Asked Her to the Dance’ is out now on FIFA Records. Catch The Vincent(s) live next at Cork’s Southern Gothic Festival on May 3.